KUALA LUMPUR (June 21): AirAsia Bhd is acquiring one Bombardier aircraft from Caterhamjet Global Ltd (CJG) for US$10 million (RM40.33 million) for the use of top executives Datuk Kamarudin Meranun and Tan Sri Tony Fernandes for official business matters. In a bourse filing, AirAsia said it has inked a sale and purchase agreement (SPA) with CJG today for the acquisition. The deal is deemed a related party transaction, as both Kamarudin and Fernandes has interests in Tune Group Sdn Bhd, which is the sole shareholder of CJG. AirAsia intends to pay for the purchase in cash, from internal funds. The price tag takes into account the market value of the aircraft, CJG’s existing outstanding loan, as well as existing payables on the aircraft. CJG, which bought the aircraft for US$24 million in July 2012 and refurbished it for US$700,000 the year after, has been planning to sell it. AirAsia said Kamaruddin and Fernandes have been using the aircraft since 2012, and the buy will provide not only executive efficiency, but also better cost efficiency, as the loss of the aircraft would mean they would have to rely on commercial flights which may be infrequent or inconveniently-timed. “This would result in significant loss of productivity due to inefficient wait times, especially with the high volume and frequency of travel undertaken by both of them,” it added. AirAsia had inked an agreement with CJG in April 2015 to obtain the use of the aircraft for Meranun and Fernandes, at an annual fee of US$3 million — inclusive of the aircraft’s maintenance — until June 30, 2017. It also signed another agreement to second staff (three pilots, an engineer, a technicial and two administrators) to operate and maintain it. The annual contribution was upped from US$3 million to US$5.75 million in March this year, which amounted to an additional outlay of US$687,500 per quarter for AirAsia. 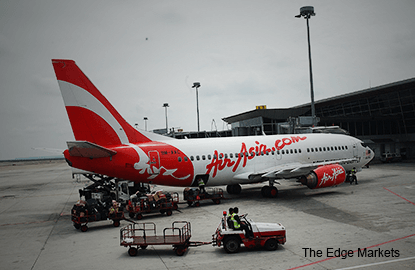 AirAsia added that the current arrangement is not efficiently structured, as AirAsia has to pay staff salaries whom it had seconded to operate the aircraft, incurring the goods and services tax (GST) in the process. The buy will bring its flight and maintenance crew back into AirAsia. “Absorbing the staff would also allow them to be better utilised, as they can be deployed to other operational functions within AirAsia and not just those associated with the aircraft,” it said. Meanwhile, AirAsia said private jet prices in Asia have declined over the past two years, with the slowdown in the regional economy which makes the aircraft relatively cheap to buy now. The purchase, which does not require the approval of its shareholders, is expected to be completed by Dec 31 this year. AirAsia shares closed 11 sen or 4.35% higher at RM2.64 today, for a market capitalisation of RM7.35 billion.